It's A Dan's World: EGG ART MAKES A HULK SMASH! 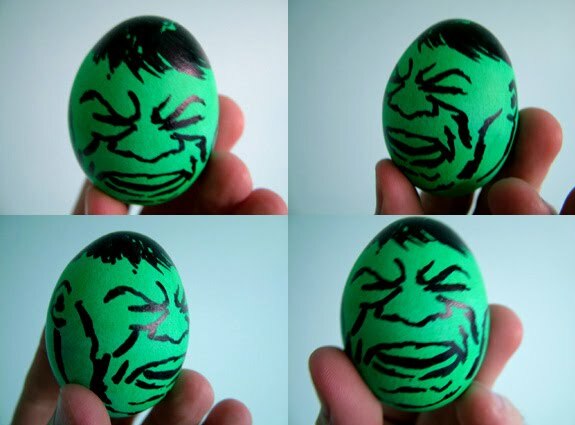 EGG ART MAKES A HULK SMASH! Eaten too much chocolate and now have a truckload of sugar to burn off before you can even think of sleeping, let alone blink? Well here's an idea to pass a few artistic hours - that is if you can still stand the sight of eggs, without your stomach doing summersaults - make your own dyed and drawn super-hero eggs! The Incredible Hulk, who has acted like one once or twice in the past, is well shown here, but if the sugar hit also has the rugrats round you jumping up and down in uncontrolable bursts of energy, you might want to round them up to do their own Spider-Man, Flash or Cyclops egg, and pool them together as a team tray of organic titans! This is one Hulk that shouldn't smash!